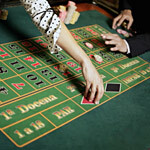 Read the list of gambling terms of roulette and you will definitely notice that the roulette wheel plays the main role there; it is not surprising actually because the name of this game confirms us this fact: the word "roulette" means "a small wheel" in French. When you come to a casino, you will definitely find the roulette wheel there: it is the symbol of every casino and gambling world in general. Do not believe roulette myths which tell you that all roulette wheels are the same because it is not actually true; there are 2 types of wheels possible to find at least: European roulette wheel and American roulette wheel. The difference between them is slight but noticeable. Let's have a closer look! 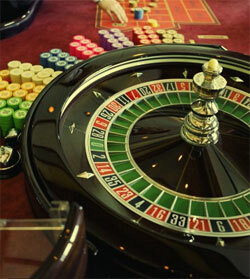 The roulette wheel determines a winning number every time when it had been spun by a croupier. Speaking about European wheel, it can be said that your chances to guess one particular winning number are 37 to 1 because this wheel consists of 36 sectors + one zero sector. All 36 numbers of the wheel are black and red and only a zero sector is green: this sector, when wins, take 2.67% of house edge from a player. To the right of a zero sector we can see 9 black and 9 red numbers (black numbers are small and red ones are big); and to the left of a zero we have 9 black big numbers and 9 red small numbers. The main difference between European wheel and American one is the number of sectors: American roulette wheel has 38 sectors on its surface: 36 black and red, a 0 sector and a 00 sector - green ones. This fact makes it not very profitable for players because a house edge for zero sectors is 5,26%. It is known from the roulette history, that there was one more sector on American roulette wheel before - it was called American Eagle; but it is absent on modern wheels of this type. 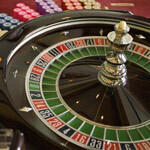 As well as on European wheel, 2 odd numbers are in turns with 2 even numbers on American roulette wheel.